Successful catalyst testing requires early planning to allow sufficient time to make necessary arrangements and timely obtain test results. The proposed milestones and indicative timeline are best practices and should serve as a reference relative to the planned catalyst change out. Catalyst lead-time is typically between 6 and 12 months. The selection process, including testing, should start several months before that. The Testing Coordinator should prepare a milestones plan accordingly and seek internal buy-in to secure necessary resources. Lastly, a Request For Proposal (RFP) at Avantium should be placed. These tests require significant planning and it is important that refineries start early to allow for a proper selection of the catalyst options and testing facility to obtain the test results in time for ordering the catalyst(s). Equally important is the assurance that the testing will be representative and accepted by the catalyst suppliers. For this, the vendors should be involved in the test design to obtain their buy-in and necessary input. Avantium recommends the involvement of the participating catalyst suppliers and a regularly interface in the alignment with all stakeholders. 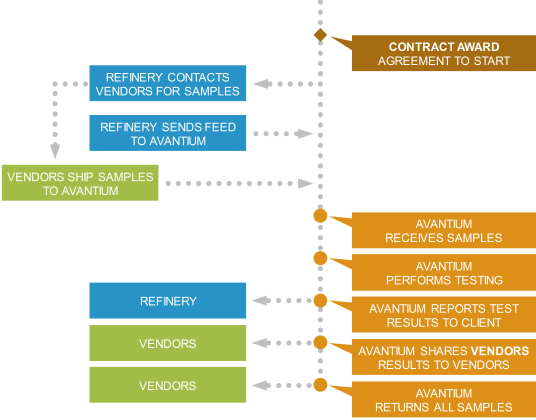 After contract award, Avantium interfaces with the catalyst suppliers to ensure buy-in on the test protocol, catalyst loading, and activation procedures, in consultation with the refinery. Below a general workflow with Avantium. Evaluate catalyst vendor claims on activity, selectivity, deactivation, start-of-run WABT, aromatics saturation and hydrogen consumption and compare against the incumbent catalyst. Opportunity (crude) feed studies – catalyst flexibility. Evaluate regenerated catalysts; refiners are the owners of the spent catalysts that can be regenerated and included in comparative testing to increase confidence in the regenerated material. Spot sample activity testing after delivery of catalyst by vendor: presulfided catalysts, regen/rejuvenated catalysts. Stability testing / deactivation studies on sets of catalysts. Step out technology options (e.g. dewaxing in ULSD). Kinetic measurements, feedstock and contaminant effects. Obtain relevant data to support refinery revamps and consideration of alternative feeds. At the end of the pilot plant test, Avantium will provide the full data set together with a complete report, within 2 weeks of test completion. The test results include a set of plots (agreed during kick-off), the most important data on conversion, mass balances, H2 consumption, and all test conditions, together with a relevant comparison between catalysts. The test results enable the refinery to independently validate catalyst performance and better determine the most efficient catalyst that most likely will provide the maximum economic benefit. For a hydrocracking catalysts test our technology allows to discriminate 1 °C difference in catalyst activity, and 0.5 wt.% in middle distillates yields. This is important because a lower gas make of e.g. 1 wt.% could result in savings up to $3MM; one month increase on cycle length could result in savings up to $0.5MM.